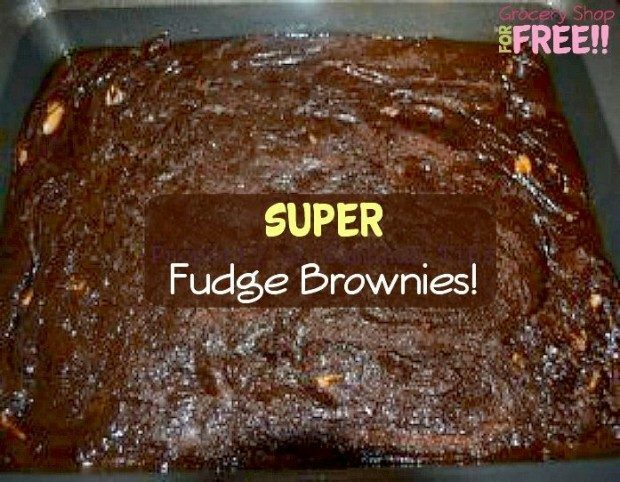 You are here: Home / Recipes / Dessert / Super Fudge Brownies From Scratch Recipe! T is back with another great recipe! Who doesn’t love chocolate?! Well here’s her Super Fudge Brownies From Scratch recipe! **There are a lot of ingredients listed but you can half this recipe with no problem. I used a long deep pan so I have to make a lot at one time. Okay, I like brownies a LOT! ** Also, I added 2 cups of melted chocolate chips to my mixture once I put it in the pan. I really want that chocolate flavor. Now the process is really simple. Do not over-mix anything. Add the dry to the wet (do it all at once). It will be coarse looking when you mix it. Just mix it well and move on. This is where I melted 2 cups of semi-sweet chocolate chips and swirled it into my pan. Now it is time for the oven! Bake at 350 until done. It will take a while at 350. I have heard people bake there brownies at higher temps for a small amount of time and then go back and drop the temperature to 350 and finish it. I don’t have time for that. I let it cook until the center no longer looks like raw batter. Tamona (affectionately known as T, to me) is a work at home mom with a husband known only as The Honey and four children, lovingly referred to as, The Tax Deductions. Get to know my more by reading, “It’s Tamona” Check out more of T’s Tips About Everything!